The direct Download option allows files to be accessed in folders by subregion. Data are still available for searching and ordering in Earthdata Search through the Package option. This data set, part of the NASA Making Earth System Data Records for Use in Research Environments (MEaSUREs) program, provides velocity estimates determined from Interferometric Synthetic Aperture Radar (InSAR) data for major glacier outlet areas in Greenland, some of which have shown profound velocity changes over the MEaSUREs observation period. The InSAR Selected Glacier Site Velocity Maps are produced from image pairs measured by the German Aerospace Center's (DLR) twin satellites TerraSAR-X / TanDEM-X (TSX / TDX). The measurements in this data set are provided in addition to the ice sheet-wide data from the related data set, MEaSUREs Greenland Ice Sheet Velocity Map from InSAR Data. See Greenland Ice Mapping Project (GIMP) for more related data. Joughin, I., I. Howat, B. Smith, and T. Scambos. 2011, updated 2019. MEaSUREs Greenland Ice Velocity: Selected Glacier Site Velocity Maps from InSAR, Version 1. [Indicate subset used]. Boulder, Colorado USA. NASA National Snow and Ice Data Center Distributed Active Archive Center. doi: https://doi.org/10.5067/MEASURES/CRYOSPHERE/nsidc-0481.001. [Date Accessed]. The investigators had some earlier problems processing data from the Jakobshavn Isbrae, Helheim, and Kangerdlugssuaq Glaciers, in part because the terminus was in a retreated position when the underlying DEM was created. Because of the slope discontinuity at the terminus, some artifacts exceeding the stated three percent error were observed. In 2015, WorldView imagery was used to extend the terminus forward and the data were reprocessed and re-released in January 2016. New data were also added at this time for the years 2009 – 2012. Users should replace all data obtained prior to 2016 for the Jakobshavn Isbrae, Helheim, and Kangerdlugssuaq glaciers with the updated data from version 1.1 or later. The new data offer greatly improved temporal sampling for the years 2009 – 2015: 298 velocity maps for Jakobshavn Isbrae (W69.10N), 115 for Helheim (E66.50N), and 101 for Kangerdlugssuaq (E68.80N). For each individual grid cell and time period, the velocity components (vx, vy) and corresponding error estimates (ex, ey) are provided in Geographic Tagged Image File Format (GeoTIFF). A JPEG image showing the magnitude of the velocity for the period is provided for easy visualization. An ASCII formatted metadata file containing source satellite acquistion information is also included. This directory contains 55 folders, one for each subregion. In each of these folders, there are subfolders labeled by date of acquisition. Each of these subfolders contains six files for each grid with data on that date: four .tif files, one .jpg file, and one .meta file (metadata file). See the File Naming Convention section for more information on these files. Refer to the following table for descriptions of the values in the file naming convention. The file sizes range from 319 bytes to 5.7 MB. The total volume of the data set is approximately 6.4 GB. This data set contains velocity data for most of the outlet glaciers for the Greenland Ice Sheet. It is organized into 55 study sites (grids). The spatial coverage map in Figure 1 shows the locations of all grids on a map of Greenland. A high resolution image of this map can be downloaded as a Portable Network Graphics (.png) file. Figure 1. This map shows the locations of grids on a map of Greenland. Grids that were expanded in 2012 are shown in blue. 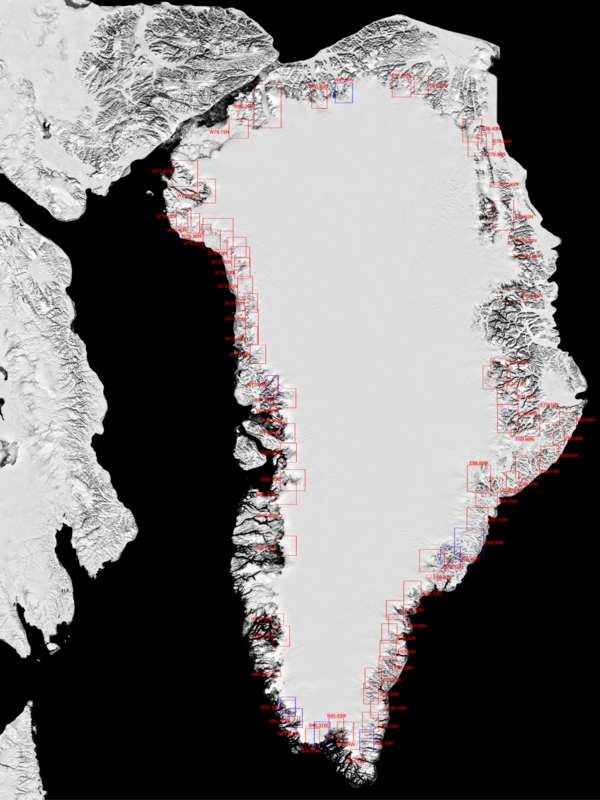 Note: Each grid lists all the glaciers that potentially lie within that grid's spatial extent. However, it is possible that data don't yet exist for all of the listed glaciers. 1Grid expanded in 2012. Pre-2012 data were regridded to match post-2012 dimensions and re-released as part of 2013/2014 update. ¹Grid expanded in 2012. Pre-2012 data were regridded to match post-2012 dimensions and re-released as part of 2013/2014 update. Data are provided in subregions of a polar stereographic grid with a standard latitude of 70° N and a rotation angle of -45° (sometimes specified as a longitude of 45° W). With this convention, the y-axis extends south from the North Pole along the 45° W meridian. The origin specifies the polar stereographic coordinates for the center of the lower left pixel, i.e., the first sample in the file. This specification, using the middle of the reference pixel, differs from that used in some GeoTIFF and other formats where the reference coordinates are specified for the outer corner of the reference pixel. This data set undergoes periodic updates as new data are collected and processed. The temporal resolution varies between 11, 22, and 33 days on an 11-day repeat cycle. The vx and vy files yield values of velocity in m/yr, in the x and y directions defined by the polar stereographic grid. The velocities are true values and not subject to the distance distortions present in a polar stereographic grid. In some areas, small holes have been filled via interpolation. Interpolated values are identifiable as the locations where velocity data are present but no error estimate exist. Radar-derived velocities are determined using a combination of conventional InSAR and speckle tracking techniques. See Joughin (2002) for more detail on errors and how they are computed. GeoTIFF files can be viewed with a variety of Geographical Information System (GIS) software packages, including QGIS and ArcGIS. The velocity maps in this data set were created using SAR data from DLR's twin satellites TerraSAR-X / TanDEM-X. The methods include a combination of speckle tracking and conventional interferometry. See Joughin (2002) for more detail. This data set was produced using Synthetic Aperture Radar (SAR) data obtained by DLR's twin satellites TerraSAR-X / TanDEM-X, which fly in close formation only a few hundred meters apart. Error estimates are provided for all non-interpolated, radar-derived velocity components (vx, vy). They include the statistical uncertainty associated with the phase and speckle tracking error inherent in the SAR data. Formal errors agree reasonably well compared with errors determined from GPS data (Joughin, 2002). However, the true uncertainty is likely larger and these estimates should be used as an indication of relative quality rather than as absolute error. Ahn, Y. and I. Howat. 2011. Efficient Automated Glacier Surface Velocity Measurement From Repeat Images Using Multi-Image/Multichip and Null Exclusion Feature Tracking. IEEE Transactions on Geoscience and Remote Sensing 49(8): 2838-2846 doi: 10.1109/TGRS.2011.2114891. Howat, I. M., J. E. Box, Y. Ahn, A. Herrington, and E. M. McFadden. 2010. Seasonal Variability in the Dynamics of Marine-Terminating Outlet Glaciers in Greenland. Journal of Glaciology 56(198): 601-613. doi: 10.3189/002214310793146232. Joughin, I. 2002. Ice-Sheet Velocity Mapping: A Combined Interferometric and Speckle-Tracking Approach. Annals of Glaciology 34: 195-201. doi: 10.3189/172756402781817978. Joughin, I., W. Abdalati, and M. Fahnestock. 2004. Large fluctuations in speed on Greenland's Jakobshavn IsbrÃ¦ glacier. Nature, 432: 608-610. Joughin, I., B. Smith, I. M. Howat, T. Scambos, and T. Moon. 2010. Greenland Flow Variability from Ice-Sheet-Wide Velocity Mapping. Journal of Glaciology 56(197): 415-430. doi: 10.3189/002214310792447734. Joughin, I., R. Kwok, and M. Fahnestock, 1996. Estimation of Ice Sheet Motion Using Satellite Radar Interferometry: Method and Error Analysis with Application to Humboldt Glacier, Greenland. Journal of Glaciology 42(142): 564-575. How do I use WGET for bulk downloading this data?